After ten years working at a stable desk job, Scott Shatford was laid off at the end of 2012. Instead of searching for another job, he decided to book a one-way ticket to Bangkok and listed his Los Angeles apartment on Airbnb to help pay the bills while traveling. Within two weeks Scott earned enough money on Airbnb to cover all of his expenses and after one month he was earning additional income to help pay for his adventures. Returning home 6-months later, he struggled for months to find work in his professional field of Business Intelligence. With his financial reserves depleted, he needed to find a creative way of making money fast. Utilizing his experience in analytics, Scott researched the short-term rental market and strategically built an Airbnb enterprise that generated over $100,000 in profit in its first year. By analyzing the performance of hundreds of thousands of Airbnb listings using his proprietary AirDnA tool, and interviewing the most prolific Airbnb moguls, Scott established a proven framework for operating a hugely successful vacation rental business. 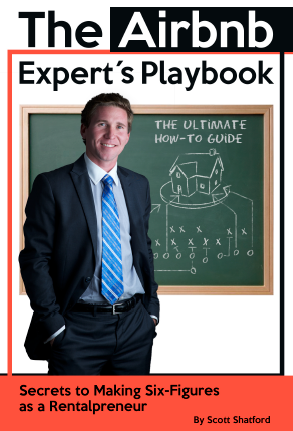 The Airbnb Expert’s Playbook: Secrets of a Six Figure Rentalpreneur, is a step-by-step how-to guide that reveals all of Scott’s tips and tricks to outperforming the competition.